I attended Presentation Camp Boston, a bar-camp style conference, on 24-Oct-2009. There were many good ideas and presentation tips. Among them, these are my favorites. When you are speaking, it is not only about the content. If you mean what you say – you really believe in it – (which I believe Dale Carnegie refers to as conviction) – then you are more likely to be successful at conveying your message and persuading your audience. Who you are being when you are saying what you are saying says more about what you are saying that what you are saying. Not just sell it – it was believe it + sell it both at once. This tip resonates with me and is consistent with a lesson from studying and performing improv; one of my instructors, Erik Volkert, really got across the difference between acting it out and really committing – and the impact that has on stage. As you are preparing to enter as a speaker, take a breath. Focus. Clear your mind. As you enter, look your audience in the eyes. Before you say a word. Greet the audience. Pause… and let them respond. Eye contact is important. Don’t scan the audience and think that’s eye contact – you need to pause and connect with individuals one at a time – this may be for the duration of a thought or statement – or just until you feel you’ve connected. Some of your eye contact moments will be during pauses and are your opportunity to re-energize by breathing. Not about presenting to large groups, but focused on presenting to very small groups of one or a few other folks in a social / networking situation. You need business cards. And they don’t need to be plain and boring… Diane’s cards have a list of tips on one side – useful and “sticky“. She advises to keep your business cards in one pocket, and the ones you collect in another pocket – just have a simple system to avoid fumbling. Write on the business cards – you may forget later otherwise that this card is from someone you offered to send a link to an interesting paper, or perhaps they might be a future business partner. Handy, easy hack. If you do give a talk to a group, be sure to have a stack of cards handy to share at the end. Prepare several generic ice breaker questions you can use when you meet someone new. A good format for such questions is “Tell me about ______.” You fill in the blank with “your job” or “how you got into this line of work” or “how you ended up at this conference” etc. Wear your name tag close to your RIGHT shoulder (since that’s where the eye most naturally is directed during a hand-shake. Don’t start with your name! Introduce yourself by saying something about yourself, and end with your name – it is easier to remember there. Saturday Night “Live” != Saturday Night “Unrehearsed” — you will be more successful if you practice some of what you will say — like what is your brief introduction of yourself (your elevator pitch), ending with your name, of course! If you want to get access to key people who may be hard to get to, consider connecting with those people who control access – such as a personal assistant to the CEO. Edwin is an Academic Evangelist for Microsoft. His talk was called The Killer Presentation – Gettting to Point B. File > Save As… and choose either PDF or PowerPoint Show. If you have Hidden slides – perhaps because you want “single source” for a slide deck that you use in multiple circumstances, but don’t want to maintain the bulk of the slides more than once – this will drop all those marked as hidden at the time you Save As. If you have Notes, they are not included either. Sometimes your Notes are just speaking points, but perhaps they are not something you want everyone to see. You are preparing a deck, and you want to be memorable. You want that “just right” image or text effect. Edwin recommends the use of royaty-free photos from http://sxc.hu. You need to create an account to access them, then are free to use them in your PowerPoint slides. Note that you are not licensed to subsequently redistribute these images if they are embedded in your PowerPoint deck. I registered an account on sxc.hu web site asking for clarification – and there was a tad bit of ambiguity around the licensing (the license text seem to both suggest it was fine and also say it wasn’t) – so I sent in a specific question on this scenario. The response from sxc.hu support was that the PowerPoint cannot be posted for redistribution. I am not a lawyer. And I do not even play a lawyer on TV. To embed an image that is too bright, overlay it with a rectangle – and set the transparency to accordinly to fade it a bit so that text can be seen on top of it. Use SmartArt to snazz up your text… transform a bullet list into a ring, or horizontal property or other eye-candy fanciness. Brainshark has a cool way for you to post your slide-deck to their free http://my.brainshare.com hosted service: you can upload both the deck *and* an audio track. This is way better than just distributing the PowerPoint deck, which may not be of any use for people who didn’t attend the talk. Of course, you do need to create (or record) an audio track. I am not sure how the slides and the audio are sync’d – like when in the audio track should slide 7 pop in – but my guess is that you are expected to record your voice while delivering the talk – and some agent on your desktop keeps an eye on when you transition between slides. If so, I wonder if it can also capture screen shots of non-PowerPoint activities – like if I pop up a web browers, or use Visual Studio. Don’t even think of reading your slides to your audience. If you cram all the text for your talk into your deck , you will be guilty of promulgating support for Death By PowerPoint. Your audience can read faster than you can talk anyway – they will be done before you. And they won’t be listening to you while they read; they can’t do both at once. Your audience will resent being read to. As Jack Welch is reputed to have said to a presenter reading him the slides: if everything is on the slides, then we don’t need you. There are better tools for a stand-alone document – like blog posts, or word-processors. PowerPoint is a poor substitute when writing a document that is being prepared for general reading. If you do need to capture more info than belongs in the slides, consider putting it into the Notes section, and then using dual-monitor capabilities to have your laptop display different content than the projector, and configure PowerPoint to know about this via: Slide Show > Set Up Show > Multiple Monitors. This entry was posted in Presenting, Trip Report and tagged presentation camp on October 26, 2009 by Bill Wilder. I attended Presentation Camp Boston on Saturday 24-Oct-2009. I sat in on several excellent talks, plus led a session myself called Better Tech Talks. which was a presentation & discussion on giving technical talks to technical people. I’ve been thinking a lot about how to give code-centric talks to software engineers, plus the general problem of clear communication through presentations. Those in my session will recognize that my slides (Better Tech Talks – 24-Oct-2009) do not stand alone well! – but should serve as a good reminder for those who participated in the session. Feel free to follow-up with me to continue the discussion! This entry was posted in Bill gave a talk, Events, Presenting and tagged presentation camp on October 25, 2009 by Bill Wilder. Boston Azure User Group Now on the Map! The Boston Azure User Group is now on the map – literally! Check out Jim O’Neil’s user group map. Zoom in on Cambridge, MA and you will see us waving from the NERD center. Thanks Jim! Speaking of Roger Jennings… at the first Boston Azure meeting this Thursday night (Thu 22-Oct-2009 @ 6:30), we’ll give away copy of his hot-off-the-presses book Cloud Computing with the Windows Azure Platform! I found Roger Jennings’ book chock full of useful information – from context to detail to practical code samples. I stopped at Barnes & Noble after a user group meeting in Burlington and picked up my own personal copy – why no Kindle version!? – and quickly plowed through it. Now I want to go back and play around with the abundant code samples. And in case you are wondering – no, this isn’t the copy we’ll be giving away…we have a new one. This entry was posted in Boston Azure User Group and tagged azure on October 20, 2009 by Bill Wilder. Gary Chin spoke at Boston Code Camp 12 (on Oct 17, 2009) – his talk was all about using SketchFlow for Silverlight. This entry was posted in Programming on October 18, 2009 by Bill Wilder. I’ve been a member of Toastmasters for the past couple of years. 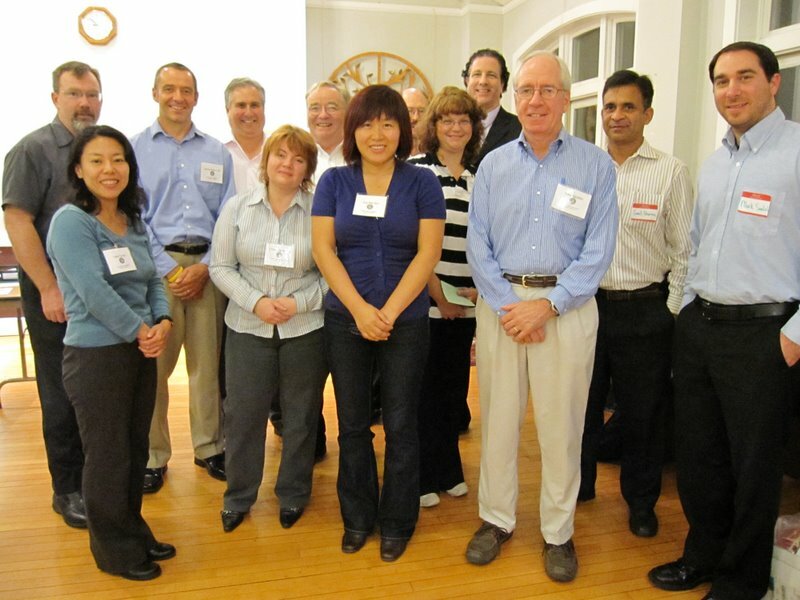 While Toastmasters has many clubs around the world, I belong to Boston West Toastmasters which meets in Needham, MA on the second and fourth Monday evenings. While at Boston West Toastmasters, I’ve made friends with some really cool people (several of whom provided ideas for my Code Camp talk on giving technical presentations) and have been working to improve my speaking skills through application of Deliberate Practice (where the feedback, ideas, analysis, expert critique and encouragement all come from fellow Toastmaster members). Now my club is reaching out to the community to help the unemployed, holding an open house encourage the general community to get a glimpse of what Toastmasters is all about… and not to mention taking part in a really fun social event. Boston West Toastmasters is offering five scholarships to the unemployed who want to improve their speaking and leadership skills. These scholarships, underwritten by Robin Samora, owner and president of Partner Promotions, cover the annual membership dues for the winners. Mark your calendar for this important OPEN HOUSE. It is a great opportunity to share your Toastmaster experience with friends, relatives and co-workers. Invite them to attend the meeting. We will have an informal start to greet guests and answer questions @ 6:30 p.m. Robin Samora is our Toastmaster for this and we will have special snacks that evening during our Opening reception 6:30 – 7 for new members (and our team if possible). Send an email to people inviting them to attend our OPEN HOUSE. It will be a memorable event!!! You don’t need to let me know – thought would appreciate a heads-up so I can look for you – but just showing up is the key. This looks like a really fun event: Soiree in Back Bay on 22-Oct-2009, co-sponsored by Boston West Toastmasters. This entry was posted in Presenting on October 18, 2009 by Bill Wilder. So, You Want to Give Your First Code Camp Talk? Gave a talk 17-Sat-at Boston Code Camp 12 called So, You Want to Give a Code Camp Talk?. This entry was posted in Bill gave a talk, Presenting and tagged Code Camp, Giving Tech Talks on October 18, 2009 by Bill Wilder. We are getting close to the kick-off meeting of the Boston Azure User Group – next week, on Thursday October 22, 2009 starting with pizza at 6:30 at the NERD in Kendall Square. Microsoft’s Brian Lambert is the featured speaker. We have a couple of behind-the-scenes planning meetings this week then will finalize the information on the bostonazure.org web site. Have you joined the Boston Azure User Group mailing list? This entry was posted in Boston Azure User Group, Programming and tagged Boston Azure User Group, User Group, Windows Azure on October 12, 2009 by Bill Wilder.